Let's get one thing straight. I love a good Bloody Mary. A little spice, a little tang, and a lotta fun. I can't do more than 2 or 3 because they're pretty rich and heavy, but I make sure to savor every salty sip. I've had a few different variations. Sometimes they're made with a little bit of beer, sometimes with a lot of horseradish, and then there was one made with cucumber and celery instead of tomato juice and called a Jealous Mary (pretty cute, huh?). 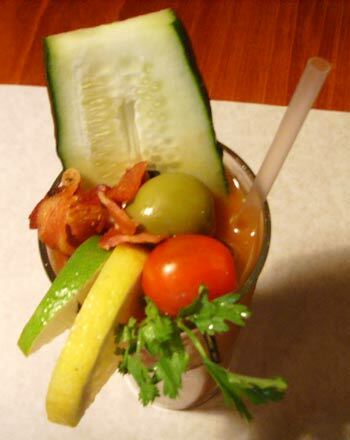 Well count me surprised when I ordered a Mission Mary at Brunch Drunk Love (sadly, it is no more but will hopefully be relocated soon) and found BACON in my Bloody Mary. Oh and not just stingily floating around at the top, there was plenty of delicious bacon swimming around in my drink too! Feast your eyes on Bloody Mary's long lost companion: beautiful, crispy bacon. And her old friends, cucumber, tomato, and olive, showed up for the party too.